I Love Lucy is a classic American sitcom. This ground-breaking, award-winning comedy show is one of the most popular shows of all time. During its six-year run, I Love Lucy was the number one show in the Nielsen ratings four times. The final season of I Love Lucy also captured the top spot, making I Love Lucy the first show to ever end its run on top. This show remains popular even today, attracting more than 40 million viewers each year. The show, which aired from 1951 to 1957, follows the life of title character Lucy Ricardo, played by legendary comedienne Lucille Ball. Lucy is married to Ricky Ricardo, a Cuban American played by Ball's husband at the time, Desi Arnaz. Ricky, like Arnaz, is a bandleader and singer who is slowly making his way in the world. Lucy is ambitious but untalented and dreams of joining Ricky in show business. The pair form a deep friendship with their upstairs neighbors and landlords, Fred and Ethel Mertz, played by William Frawley and Vivian Vance. Several episodes of I Love Lucy are counted among the best television episodes of all time. Many critics and fans are especially fond of Lucy Does a TV Commercial. In this episode, Lucy schemes her way into acting in a commercial. However, the product she tries to pitch is foul-tasting and incredibly intoxicating. As filming progresses, Lucy becomes completely inebriated and her attempts to pitch the product, Vitameatavegamin, become increasingly inept. I Love Lucy was the first television show to be filmed on 35mm film; the stars of the show, Lucille Ball and Desi Arnaz, insisted that the show be filmed on 35mm film so that the show could be produced in Hollywood instead of New York. I Love Lucy was also one of the first shows to be filmed with multiple cameras in front of a live studio audience, giving the show an authenticity and continuity that would set it apart from its rivals. In addition to its use of 35mm cameras, I Love Lucy also pioneered the idea of the rerun. During the second season of I Love Lucy, Lucille Ball needed extra time off due to her advanced pregnancy. Rather than take the show off the air, Desi Arnaz convinced the studio to re-air episodes from the first season. These reruns were an unexpected hit, keeping viewers engaged and interested in the show. Lucy accidentally destroys a commissioned statue and must impersonate it for the unveiling ceremony. Lucy leads a glamour revolt among the suburban housewives when their husbands are momentarily overwhelmed by a pretty visitor at a country club dance. Episode 23 - Building a B.B.Q. Five hundred chicks, part of Lucy's latest moneymaking scheme, have taken over the house! The Ricardos must move into the cramped apartment of the Mertzes before taking possession of their new country home. Lucy wants to move to the country but dreads leaving the Mertzes. Little Ricky's noisy new puppy keeps the neighbors up at night. Ricky's disapproval of Lucy's new hat leads her to try a trophy cup on for size. Little Ricky's school pageant - "The Enchanted Forest" - is coming up and it's coming up short on cast members, so the Ricardos and Mertzes volunteer. Ricky's a hollow stump, Fred's a frog and Ethel's the fairy princess (because she can fit into the costume). And Lucy? She's a witch. To keep their husbands from judging a beauty contest, Lucy and Ethel scheme to have their pleasure boat run out of gas at sea so the guys will miss the pageant. When Lucy misplaces their train tickets, she and Ethel must share a drive to Florida with a woman they fear is a murderess. Lucy tries to reunite a Venetian gondolier with his brother, who lives in America. Lucy must help Little Ricky overcome his stage fright when he is scheduled to play the drums with a children's orchestra. Lucy calls up her old drama teacher when she believes that she will be in a play with Orson Welles, and her teacher ends up bringing the whole class down to watch. But what Lucy didn't realize was that Orson Welles really just wanted her as his assistant in a magic trick. When Little Ricky shows an interest in playing the drums, Lucy and Ricky decide to get him a set to play, but they don't realize the effects that it will have on the entire apartment building and their best friends, the Mertzes. After Lucy overhears that Ricky will invite a celebrity to his new commercial, it leaves her curious to see his performance and introduce herself. On the flight home from Europe, Lucy disguises a 30-pound hunk of cheese as baby in order to avoid an extra baggage charge. Lucy's accidental windfall at the casino starts trouble between the Mertzes and the Ricardos. When a movie director discovers Lucy in Italy, he asks her to take part in it. Desperate to "learn the part", Lucy winds up working with real Italian women making wine, by smashing grapes, with disastrous results. The Ricardos and Mertzes become snowbound in the Swiss Alps. The guys want to teach their wives a lesson in Paris fashion. Lucy wants to discover an unknown talent in Paris but she winds up meeting a co artist instead. Lucy dreams of visiting the Scottish village of her ancestors but it becomes a nightmare involving a two-headed dragon. Lucy goes on her first fox hunt in order to keep an eye on Ricky and a beautiful actress. Lucy schemes to get Ricky away from his band duties aboard the ship so that they can spend some romantic time alone. Fred's seasickness may spoil the trip to Europe. Lucy must find a way to break some rules in order to be with Little Ricky for his overnight hospital stay. Fred has a Western-themed show coming up at his lodge and he wants Ricky to perform in it. He can't - but Lucy and Ethel volunteer (Lucy yodels "Home on the Range"). The reason Ricky can't appear is that he has a "radio" show that night. Or is it a "rodeo" show? Ricky Ricardo's new fame leads to an invitation to appear on the popular interview program "Face to Face", and Lucy and Ricky consider moving. Ricky's agent arranges an appearance for him and suggests that they stage a fight so Lucy and Ricky won't have to stay. In the end the scheme falls flat while "Face to Face" is on the air. Everyone treats Ricky like a big celebrity upon his return from Hollywood. There's a jewel thief on the train they're taking cross-country and Lucy intends to catch him. Ricky sells his car, and the Mertzes think they are being stranded in California. Lucy thinks she may have finally gotten her big break in Hollywood. It all centers on a posh party attended by studio execs. Ricky was invited to attend but begged off. But Lucy will fool 'em. She has a lifelike rubber replica of Ricky's head, which she'll attach to a dummy body - and she'll dance her way to stardom with "Raggedy Ricky." Lucy may be arrested for stealing John Wayne's cement footprints outside Grauman's Chinese Theatre. Lucy and Ethel attempt to steal John Wayne's block from Grauman's, but Lucy winds up with her foot stuck in cement while hiding from the police, and now must hide from Ricky. 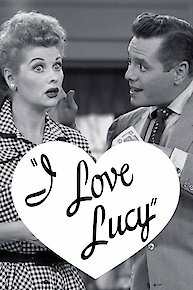 I Love Lucy is currently available to watch free on CBS and stream on CBS. You can also stream, download, buy, rent I Love Lucy on demand at Amazon Prime, Hulu, iTunes online.